CMT Creates Music is an art project led by Tim Phillips to create awareness for Charcot Marie Tooth disease (CMT) through the creation and performance of experimental musical instruments. It is a unique collaboration between artists, musicians and experience with Charcot Marie Tooth disease. The project facilitates the creation of new musical instruments by people with little to no previous experience of making them, but are highly skilled in other fields such as electrical engineering, filmmaking, bike racing, printmaking, teaching, to name a few. There are ten instruments so far, the results are diverse and unexpected, each bringing a new design process and new ways and needs to collaborate. These instruments have had a tendency to be large, so we have chosen three to exhibit in the Window Gallery, the Stringtotter, the Chime Forest and the Bubble Organ. The Stringtotter is the result of a violinist who has too much fun at the park. 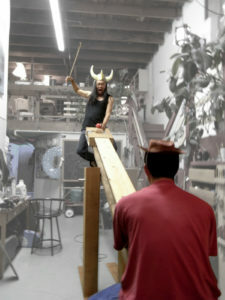 A long two string bass is mounted to the topside of a teeter totter, requiring two people to play it as they ride the instrument; one plucking or bowing rhythm, one changing pitch. The string bass sounds are then amplified through an effects pedal, the variables of which are adjusted by the motion of the seesaw, meaning the sound changes depending on the position of the performers. 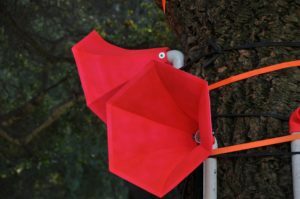 The Chime Forest is a patient electricians instrument, with careful repetition in its construction, the sound of a corralled wild force is the reward. The instrument consists of 18 glass vases, each with an electric motor suspended above it that can be raised and lowered by the performer. The motors have various things attached to the ends that throw the rotation off balance and make the motors jiggle. When the motors are lowered, they collide with the vases, making a tone. Since the motors are unbalanced, they bounce off the vases and then collide again, creating a fairly regular but unpredictable rhythm. Combining multiple motors creates evolving polyrhythms that are equally driven by happenstance as the performer. The Bubble Organ was created due to a fascination of bubbling tones and an effort to manually control them just enough to play music. 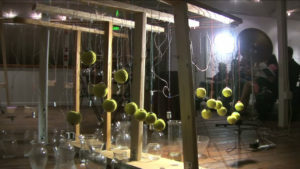 The result is a wind instrument that has a system of manual bellows allowing the performer to blow bubbles into a variety of acoustic chambers filled with water. Each chamber plays differently pitched bubbling tones that can be either individual bursts or long drones that are acoustically amplified for the listener through exponential horns. Online, ‘CMT Creates Music’ has used this unusual instrument making process to introduce people to the disease CMT. Conception of these instruments has been documented in a blog alongside personal experiences from people living with CMT, every post is half instrument design, half CMT experience. The two dialogues have fed enthusiasm for each other, taking turns to generate energy and discussion. The result is a project that was envisaged to be a month long and has now been running for nearly seven years with over 30 collaborators! A big problem with CMT is that people don’t know about it, even though it affect 1 in 2500 people in the US alone. This means that a huge number of people that have it are misdiagnosed and so suffer more than they need to. CMT is short for Charcot Marie Tooth. It is a neurological disorder that causes damage to the peripheral nerves; a peripheral neuropathy. In very general terms, the connection between the brain and both muscles and sensory organs is damaged. For example, if someone touches a CMT patients foot, the foot senses it, but the message never gets to the brain, so they don’t feel it. CMT patients slowly lose normal use of the feet/legs and hands/arms as nerves to the extremities degenerate. An international team of researchers, backed by the CMTA, have had a breakthrough in finding a cure and are currently working through the trial procedure. This project raises both money and awareness to support that cause. Please tell someone else about CMT. Tim Phillips is an English sound artist, musician and inventor based in Oakland, CA. His work looks at making people curious about sounds and rhythms, while using participation and collaboration to encourage interdisciplinary and unexpected outcomes. Tim received a BA and MA in architecture from Sheffield University, England and has worked on public architecture and installations throughout Great Britain and France. He is currently a senior designer at an Oakland-based design studio, Gyroscope, Inc., designing interactive exhibits and artworks for museums and public spaces across the US. Tim has CMT, so this project is close to his heart. It has become remarkable thanks to a community of generous collaborators that continue to open it in new directions.